If you’re camping or alternatively find yourself somewhere cold without a thermos flask, there are various techniques you can employ to keep your drink warm. For portability, the best thing you can do is stock up on Styrofoam cups from the nearest coffee shop. If you're at home, use a heat bag that can be warmed up and placed around the container; this method will keep your drink warm the longest, but you'll need access to a microwave. Make the drink at a hotter temperature than you would normally drink, if possible. If you're making it before going out, prepare it at the last possible minute so that it has less time to cool down. Pour the liquid into a glass container rather than a plastic one, as this will retain the heat for longer. 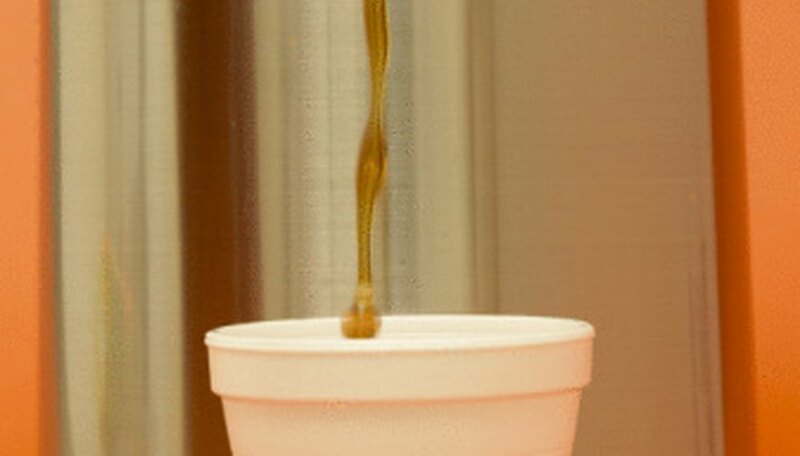 Pour the liquid into a Styrofoam cup. This is an insulating material that will retain the heat for longer. Alternatively, pour the liquid into a container and wrap a layer of polystyrene around it. Place a heat bag on one side of the container and wrap a towel around it. Whatever container you use, it should be airtight to prevent heat from escaping. Harris, Linda. "How to Keep Liquid Hot in a Non-Thermos Container." Sciencing, https://sciencing.com/keep-liquid-hot-nonthermos-container-8668344.html. 24 April 2017.